I love to cook. It’s the process itself – creative and experimental – as much as the delectable end results that has drawn me to it since I was young. What does this have to do with repurposing content? Read on and all will come clear! At the weekend, we had guests for Sunday lunch and I was up at the crack of dawn preparing a huge shoulder of lamb to slow roast. The meal was delicious (if I do say so myself) but it’s the leftovers that excite me and get my imagination bubbling! There are so many possibilities to use what wasn’t eaten at the meal – a stew, a broth, a chilli, pulled for sandwiches – the list goes on. Not only do I make sure that not a scrap goes to waste, I get to enjoy the food in different forms – and also people who couldn’t make the meal still get to taste the core ingredient that was so lovingly prepared. It’s what happens with the leftovers that serves (yep, I meant that pun) as a useful analogy for repurposing content. Repurposing content is the act of taking a piece of content, be it a blog, video, infographic, podcast etc. and repackaging it into a different form. So, for example, you may take a blog and create a video based on that particular piece. Or you could break up the blog and rework it into micro chunks that are perfect to share on Twitter. In essence you are taking an original piece of content and creating more content in different forms, for different platforms, based on that original piece. Why Should I Repurpose Content? As my cooking analogy suggests, repurposing content helps you to improve on the ROI of the piece and also help to extend the reach of it. So – you may have a blog post that sits on your website. It’s well optimised for certain keywords and is thus likely to rank well in Google – meaning you’ll get organic traffic via searches. That’s great. But what about those in your audience who won’t come across it in that way – or that don’t particularly enjoy reading blogs? 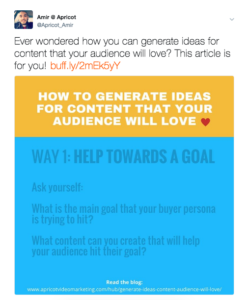 This is where repurposing content can be a brilliant tactic. The pieces of content that you create from the original can be optimised for the differing platforms. For example, a video that can live on YouTube. A SlideShare presentation that you can embed on your website and also link to your LinkedIn profile. A series of quote images that look great on Instagram. A condensed post that can be added to your Facebook page. A webinar that you can host. This way, you package and deliver your content to where your audience are – rather than just hoping they come to you. You can use repurposed content to drive traffic back to your original blog if your strategy demands that – (for example, if there is a call to action at the end of the blog for the user to get a download etc. thus helping to build your email list). What Content Should I Repurpose? The best content to repurpose is the content that has performed well for you so far. This is because you know that you’ve got a topic that has resonated with your audience and that there is interest in it – so this suggests that there is mileage in extending it’s life beyond that of the current form it takes. How do you know what your most popular content is? Check out your analytics. This is helpful, especially for blogs – because time on page is a great indicator for engagement in that piece. If you have page tracking software, so you can see how far down a user has scrolled, so that is even better. Also, evergreen content is prime for repurposing. Evergreen content is content that is always fresh and relevant for readers (it’s a good idea to purposefully include evergreen topics in your content strategy). What Do I Repurpose My Content To? Just as I have decisions to make whether to make a soup, stew, chilli etc. with my leftover lamb, we also have choices to make about what forms we repurpose our content into. A strong first step is to know your audience – what are the main channels they engage on? If your audience’s main channel is Pinterest, don’t go rushing to grab a video camera and make a piece of content for YouTube. You’re best off creating a cool infographic or a series of images aka producing content that is native to Pinterest. On the same token, if your primary audience is on LinkedIn – you aren’t likely to get much joy creating a series of Snapchat videos if you want to engage. A SlideShare presentation or a white paper may be a wiser investment of your resources. So know your audience. Know where they are – what they engage with and then experiment with that. Experimentation is such a core part of marketing that in my experience, a lot of people either ignore or overlook it. Or worst still, frame things through a lens of “failure”. If you create an infographic and it gets very little traction – it doesn’t mean that a) infographics won’t ever work for you or that b) the process of repurposing is a dead end for you. It just means that you need to figure out why the result was what it was and use that data to make better decisions and content going forward. Adopt a frame through feedback over failure and get experimenting until you find out what works best for you and your audience! 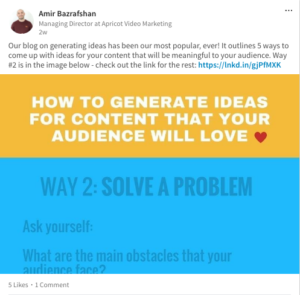 This article on generating ideas for content is one of the most popular posts we’ve ever created. The number of hits and time spent on page were very good, so this was a pretty obvious choice as a base to repurpose content from. Had an infographic designed (soon to be added to the Hub) – currently living on SlideShare. Put together a SlideShare presentation (linked to my LinkedIn profile). Cross published the original post on LinkedIn Pulse. You’ll also notice a call to action on a funky banner a little further up this page that invites you to download an Idea Generation Toolkit. 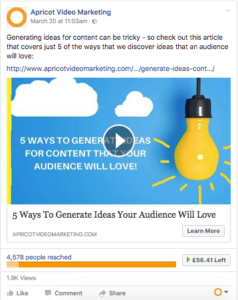 This toolkit is an extrapolation of the original post meaning we’ve created increased value that we want to give away for free. The reason we expanded upon the material in the original blog and created this “content upgrade” is because having users implement what we create content about is important to us – it means that they get the maximum value from what we publish. We believe that it’s not information that you need – it’s implementation. I guess it’d be the difference between just looking at a tasty plate of food that I’ve cooked up for you compared to feasting on it. I want you to dig in and get all the goodness on offer! So, the toolbox is a mix of content that helps to make implementation as easy as pie – including a video, template and ideas map. Download it and check it out. Perhaps it will give you inspiration on how you could create a “content upgrade”. This repurposing content process has helped us get so much more from the original content than we would have gotten had we merely left it sat on our blog. Repurposing content in ways native to other platforms has helped the original post get even more traffic as well as impart the information to those who have not visited our website post. Repurposing content is a big part of our marketing strategy – we tend to take around a week to research, prep and write a post, then spend the following week repurposing it. This helps us put out quality over quantity and also ensure the return on each post is optimal. I encourage you to experiment with repurposing content. The following is a plan of action for you to follow but of course tinker with it as much as you wish – one size doesn’t fit all in marketing! For other ways of repurposing content, check out this handy article by our friends at Siteoscope (lots of actionable advice). 1. Choose your original piece of content – A very popular piece or a piece with good engagement but that perhaps hasn’t had the exposure you think it deserves. 2. Know your audience – which platforms do they tend to lean towards? Make a list. 3. Become familiar with what native content on those platforms look like. Can you see the differences between Twitter, LinkedIn, Facebook, Instagram etc.? 4. Then repurpose your content and distribute it to those platforms over the course of a couple of weeks to a month. 5. Check on the engagement stats for each platform – how has the repurposed content been performing? 6. Check the analytics for the original piece of content – have you seen a lift in traffic? At the end of this activity, sit down and examine the performance of all of the elements. Figure out what you can do better next time – which platforms to focus more on – which platforms to forget about – which content formats are working for you and resonating with your audience. Don’t expect miracles overnight. Making real progress in marketing can be slow and steady – it often is – and that’s ok so long as you’re learning implementable lessons to take forward with you. Just like when you’re cooking, you taste as you go – you make sure the ingredients work together – if something burns or doesn’t taste nice, you can try it again and the huge benefit is that you’re in a better place to make better decisions next time.